Hardly renowned for his political masterstrokes, Malcolm Turnbull has just drenched the opposition with his Snowy 2.0 plan. The Snowy Hydro Scheme is – without doubt – the single greatest renewable energy project ever built in Australia – with a mammoth 3,950 MW of capacity, which is available on-demand (unlike the infantile nonsense that is wind power). It cost $1 billion (in today’s money) to build. Cheap, clean, reliable power aside – the Snowy system allows for the capture and orderly release of water into the Murray and Murrumbidgee Rivers which – over 50 years – has built and maintained hundreds of thriving rural communities downstream. Agriculture and horticulture – which would have been otherwise impossible – fed by water sent West to the plains, not East to the sea – led to sustainable economic growth and wealth for thousands of migrant families that settled along these rivers in the Sunraysia and SA’s Riverland. The Snowy scheme has prevented South Australia from dying of thirst a dozen times since it was built. Adelaide survives – and only survives – thanks to the water fed to it down the Murray from the Snowy system (for more see our post here). The nation’s iconic Snowy Mountains power scheme will be “turbocharged” with a 50 per cent increase in capacity to guarantee more electricity for households and employers, as Malcolm Turnbull moves today to invest $2 billion to ensure energy security. The Prime Minister will unveil plans to build a “Snowy 2.0” to power the equivalent of 500,000 homes and meet demand in peak periods across the eastern states, in the first extension of the vast hydro-electric scheme since the 1970s. The government aims to create a new power station bigger than most of the country’s existing generators, including Victoria’s Hazelwood coal-fired station, while acting as emergency storage for the entire electricity grid from South Australia to Queensland. As Mr Turnbull vows to use “all of the powers that we have under the Constitution” to fix the ­nation’s energy crisis, he will launch the first steps towards constructing new tunnels and turbines in the Snowy. Today’s announcement comes after the Prime Minister put gas producers on notice the Coalition was prepared to impose tough regulations on the sector unless it ensured sufficient gas flowed to the domestic market. ­Securing a guarantee from ­energy companies that gas would be available in times of peak ­energy ­demand, the government also ­ordered producers to increase how much gas flowed to the domestic market as a matter of urgency. Mr Turnbull will claim today that the 50 per cent expansion of the Snowy “will make renewables reliable” by providing storage for intermittent wind and solar power, releasing the electricity to the market when needed. “This will ultimately mean cheaper power prices and more money in the pockets of Australians,” Mr Turnbull will say, according to a draft of today’s statement. The government will present the plan as an “electricity game-changer” that will help prevent a repeat of the outages in South Australia and other states over the summer, which have fuelled fears of shortages from a lack of investment in new generators. Built from 1949 to 1975, the Snowy has nine power stations along a network of dams producing 4100 megawatts of electricity at full capacity. Today’s proposal will add 2000MW by using the ­existing reservoirs to power new turbines in a new network of tunnels, without requiring an increase in dam capacity or any change to the water released for environmental flows and irrigation. The plans are backed by Snowy Hydro, the operator of the current scheme, but will need approval from the NSW and Victorian governments given the utility is jointly owned by the commonwealth, NSW and Victoria. Snowy Hydro chief executive Paul Broad said the NSW town of Cooma could return to its “halcyon days” when the scheme was under construction. He predicted it would take about four years to build and have a “big impact” on the region, with “a lot more jobs” in the construction phase. “I describe it as being like the halcyon days of building the Snowy when 100,000 people lived here. This place boomed (with) the pubs and the various forms of entertainment for all the migrant workers,” he said. 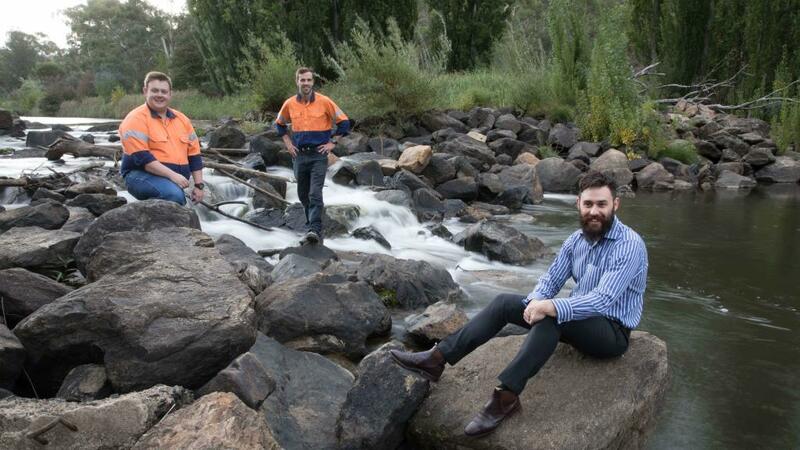 Civil engineer Paul Smith, 26, who started in the graduation ­program with Snowy Hydro in 2015, said the opportunity to add to the “legacy” of workers gone by was “quite exciting”. “We look after the assets, we maintain them, but this is an ­opportunity to add our own bit to the legacy,” Mr Smith said. His colleague Tom Reed, a 27-year-old strategic engineer in dam safety who is in his fourth year with the Snowy, said they were ­always looking to ­maximise the scheme, but adding on a “whole new section” was ­remarkable. The Prime Minister will today announce a feasibility study to map out the construction plan but the early work by Snowy Hydro suggests building three new tunnels between the existing Tantangara and Talbingo reservoirs in southern NSW. While the distance between the two reservoirs is only 9km, the construction work would have to extend for 27km to create the three tunnels: one to send water through the turbines, one to pump water back to the higher dam and ­another “surge tunnel” for ­overflows. The height difference between Tantangara and Talbingo is 680 metres, ensuring water pressure that can power the turbines. As with the rest of the Snowy, the electricity would be produced to meet peak demand on the grid by releasing water through the ­turbines. While some of the funding for the scheme will come from the Australian Renewable Energy Agency — a federal agency the Coalition once tried to scrap — it could also be funded by Snowy Hydro itself, with the utility producing a financial return over time. 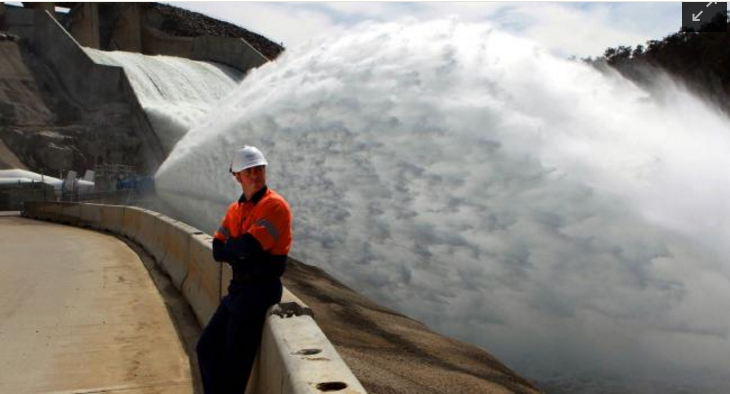 Snowy Hydro would then buy electricity or use its own at off-peak periods to pump the water back to the higher reservoir, in ­effect “storing” the electricity for when it is needed. An existing part of the scheme called T3 already produces about 2000MW at this part of the Snowy and the new proposal has been dubbed “T Zero” by engineers ­because of its similarity to the existing turbines. The construction is estimated to cost $2bn but the final figure would depend upon the feasibility plan. The move comes as Mr ­Turnbull faces increasing criticism from Bill Shorten over rising power prices caused by shortages of gas for power stations, the ­closure of older coal-fired stations and the surge in demand during peak periods such as heatwaves. The Opposition Leader ­labelled his opponent as “don’t blame me” Turnbull yesterday as the Prime Minister rebuked state governments for not releasing more domestic gas to keep ­electricity supplies up and prices down. “You’ve got to wonder why he bothers being Prime Minister if he keeps outsourcing the decisions on everything to everyone else,” Mr Shorten said. While today’s announcement will only be the first step in the Snowy project, it promises to ­deliver 20 times the electricity South Australian Premier Jay Weatherill wants to generate from a $150 million investment ­announced on Tuesday in a 100MW battery storage system. The South Australian battery scheme could last about one hour at full demand but the expansion of the Snowy would generate power for longer. The government estimates it could provide 350,000MW/h over seven days. The new capacity could be ­included in the renewable energy target — helping to reach the goal of generating 23.5 per cent of electricity from renewables by 2020 — amid continued debate about the renewables policy. Western Sydney Liberal MP Craig Kelly yesterday repeated his call for a “freeze” in the target but made his comments on Sky News before the government’s Snowy announcement. Mr Turnbull will paint the ­proposal as a way for Australians to “keep the lights on” in a way that complements wind and solar power without hurting coal and gas. In a shot at Labor’s aspiration to generate 50 per cent from renewables by 2050, the Prime Minister will say that the Snowy plan represents “sensible” policy in contrast to “reckless targets”. Malcolm Turnbull’s ‘Snowy 2.0’ was called a ‘thought bubble’ by a few. However, if a $2 billion investment in 2,000 MW of synchronous, dispatchable power generation is a thought bubble, then it’s hard to find words to describe $150 million for a 100 MWh battery which would power South Australia for all of four minutes (‘brain fart’, perhaps?). While a few members of the wind-cult cheer-squad tried to convince themselves that Turnbull’s Snowy 2.0 heralded the beginning of a wind power revival, the economics and politics will, inevitably, conspire against the wind industry and its acolytes. As we detail below, the economics of pumped hydro depend upon the cost of the power used to pump water uphill for later use. Then there is the time that it will take for Turnbull’s Snowy expansion dream to be realised. Initial estimates of 4 years sound somewhat hopeful. It is more likely to take 7 or 8 years and cost something in the order of $7-$8 billion, rather than the $2 billion mentioned above (see below). In politics a lot can happen in 8 years. One of the inevitable results of Australia’s energy debacle that has struck fear in the hearts of renewable rent-seekers is the fact that the Large-Scale RET is about to go to penalty, simply because there is insufficient eligible renewable energy being generated and no stomach to invest in an ‘industry’ that exists and only exists by reason of a policy under immediate mortal threat (see our post here). One major power retailer has already paid $123 million in ‘shortfall penalty’ (a $65 per MWh fine imposed on retailers for not purchasing Renewable Energy Certificates) and more will do so this year (see our post here). With new large-scale wind and solar projects that can be counted on one hand, there will be little new renewable capacity added, such that the shortfall penalty will hit $1.5 billion a year by 2020 and total more than $20 billion between now and 2031 when the LRET expires. There is nothing in Turnbull’s Snowy 2.0 that is going to alter the level of political toxicity attached to the imposition of billions of dollars worth of fines imposed on power consumers. And as for those believing that pumped hydro will save the wind industry as it currently exists, most of the wind turbines speared across Australia are already more than 5 years old and many are pushing 8. The bulk of these things went up between 2009 and 2012. In 8 years time most of them will be well past their useful economic lives and will be quietly rusting in some dimwit’s back paddock (see our post here). At a policy level, there are some serious questions about how the scheme would be funded and about whether or not renewable energy certificates would be awarded to wind power outfits for notionally dispatching power used to pump water uphill for later use. At issue is whether there would be a REC awarded for wind or solar power consumed by the pumped hydro system being proposed, as well as a REC being issued to Snowy Hydro when it used its stored water to dispatch power back to the grid. Notionally, Snowy Hydro would be entitled to a REC for each and every MWh dispatched to the grid, irrespective of the power source used to pump water uphill for storage and later use (including the most obvious source, power from coal-fired plant running over-night). As we detail below, courtesy of Peter Lang, the economics of pumped hydro critically depends upon having a regular supply of very cheap power, which can only come from base-load power plant (Peter Lang considers coal and nuclear the only economic options). The cost of pumped hydro using wind power subject to the subsidies paid under the LRET would send the cost of the pumped hydro power through the roof. If anything, Turnbull’s Snowy 2.0 has the prospect of allowing coal-fired plant to remain profitable, by opening a substantial new market for their excess power at night or during other periods of low demand. And, to the same effect, Snowy 2.0 creates an opportunity for the owners of coal-fired plant to sell power to Snowy Hydro at times when the wind is blowing and they would otherwise be knocked off the grid, due to the $90 per MWh REC subsidies that allows wind power outfits to dump power for next to nothing (see our post here). Now to the engineering and the economics. Peter Lang has given permission for this to be reposted from Brave New Climate but would like to clarify that: Pumped hydro is rarely viable nowadays, and I expect this new Snowy Hydro proposal is unlikely to be feasible. Energy storage is essential for intermittent renewable energy generation and is valuable with coal and nuclear generation too. Pumped-hydro is a mature technology and is generally the least cost option for large scale energy storage. This paper provides a rough cost estimate for a pumped-hydro energy storage facility that would utilise existing dams and reservoirs in the Australian Snowy Mountains Hydro Electric Scheme. The paper is in response to questions about the cost of pumped hydro energy storage, especially as a component of a fossil-fuel-free electricity generation scenario for Australia. The paper is the fourth in a series of articles (see here for a listing — search this page for articles authored by Peter Lang). 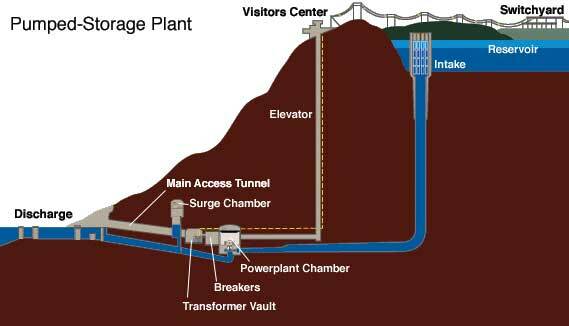 Figure 1: Conceptual diagram of a pumped-hydro energy storage facility. The proposal is to build a 9 GW pumped-hydro facility by connecting two existing reservoirs with tunnels, pipes, generators and pumps. The two reservoirs are Tantangara (the upper reservoir) and Blowering (the lower reservoir). The difference in elevation between the water levels in the upper and lower reservoirs is 875m (see Appendix). The tunnels to join the two reservoirs would be 53km long (Figure 2). The facility would generate 9GW peak power, for 3 hours per day from 6 hours of pumping at full pumping rate. It could generate for longer at less than 9GW, or if pumping was for longer than 6 hours per day, or if the pumping rate is greater than assumed in this analysis. The proposal is to bore three tunnels, each of 12.7m diameter, to link the two reservoirs. The reservoirs would be tapped near their down-stream ends to maximise the volume of water storage available. About 3km of the tunnel at the lower end would be steel lined to prevent leakage (Army Engineering Manual; EM_1110-2-2901 – Chapter 9). There is just about sufficient ground cover along most of the remainder of the tunnel route to avoid the need for waterproof lining or grouting for most of the remaining 50 km of tunnel. The rocks to be tunnelled through would be mostly granite and similar strong, hard igneous rocks. There may be some hard sedimentary rocks, possibly including minor amounts of limestone. The rock would be fractured and faulted. 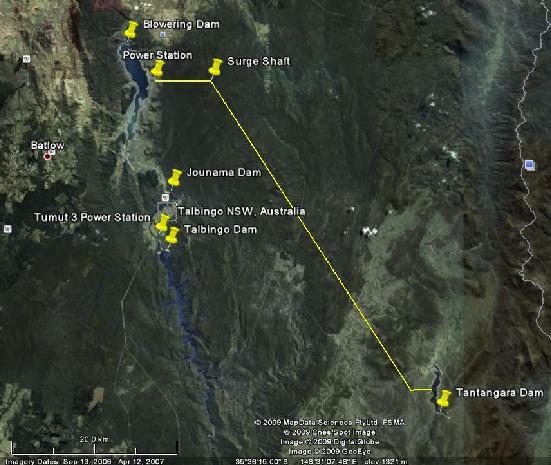 The power station is assumed to be similar to Tumut 3 in that it would have six turbines in a power station of similar size to Tumut 3. The differences are that the power output will be six times that of Tumut 3 (because six time the hydraulic head). There would be six pumps rather than the three at Tumut 3. Another difference is that some 3km of steel lining will be required in the tunnels. Issue – Francis turbines, which are best for pump storage, currently have a hydraulic head limit of about 600m. Tantangara-Blowering is 875m hydraulic head. The manufacturers are working on increasing the upper limit. I understand manufacturers are working at the moment to double them up. The table below provides a ball park cost estimate for the scheme. The tunnel costs, the main component, were calculated using costs for rock tunnel excavation from world wide experience. The power station, pumps, etc, were estimated by multiplying the original costs (from 1967) for Tumut 3 by 10 (that is approximately how much inflation between 1967 and 2009), and by doubling the cost of this equipment to allow for the six times greater water pressure and, therefore, power output. The greatest uncertainty is the cost of the steel pipes, tunnel lining, power station and ‘Allowance for Other’. How realistic is this cost estimate? World experience is that hydro projects cost about US$2,000/kW to US$4,000/kW. The Electricity Storage Association gives a range of costs for Pumped-Hydro of US$500/kW to US$1500/kW. This project is A$744/kW. 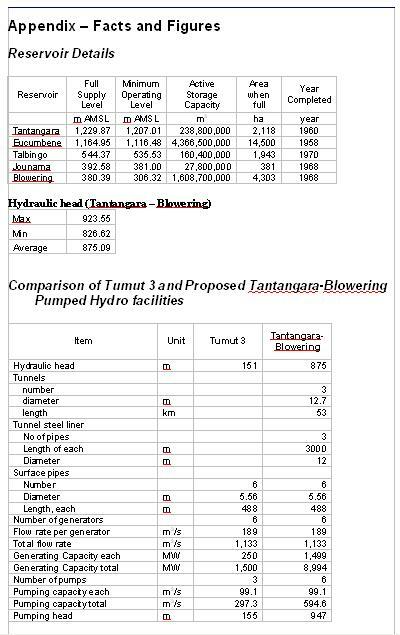 So the proposed Tantangara-Blowering facility is towards the low end of the range (if the figures are correct). The main reason for the lower than average cost is that the reservoirs do not have to be built; they already exist. However, this project requires more tunnelling than is normal for pumped-hydro facilities. The Tantangara-Blowering pumped hydro scheme would be a high capital cost investment for just 3 hours of peak power generation per day. This is the most economic of the four projects investigated. Pumped hydro is often economically viable for providing peak power for a system comprising mostly fossil fuel and/or nuclear generation (France’s system is the ideal example). But pumped hydro is not well suited to intermittent, unscheduled generators. I would like to acknowledge the help of some friends, all of whom have had a life time of experience working on hydro-electric projects around the world (all but two still are). Our work on hydro sites and our friendship go back 39, 33, 33, 29, and 19 years. I would like to thank Rich Humphries and Dr Derek Martin for their invaluable assistance (and for taking time off from catching neutrinos to help me: they are building a large underground cavern deep below Sudbury, Ontario to catch neutrinos that will be beamed through the rock from Chicago); Tim Little (Canada), Andreas Neumaier (currently in Asia) both of whom have a life-time of experience designing and constructing hydro-electric projects; and David Purcell who was the first boss I had who could influence me. He grew up in Cabramurra, the construction camp for the Tumut 1 and Tumut 2 projects in the Snowy Mountains Scheme. On weekends he would go with his father, a civil engineer, around the scaffolding and walk-ways as he checked out the construction work and instrumentation on the Tumut Pond concrete arch dam, Tumut 2 Dam and the Tumut 1 and Tumut 2 underground power stations. What a way to start a life. Certainly, today’s young can’t get that sort of early experience of the real world. 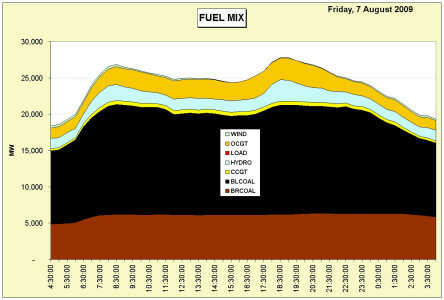 Pumped hydro is an excellent match for nuclear and for dirty brown coal fired power stations (because they run at full power all the time and produce very cheap power). Consider the 2007 NEM demand: Peak = 33GW, average = 25GW, base-load = 18GW. Option 1 – nuclear only. 33 GW @ $4b/GW = $132b. Option 2 – nuclear + pumped hydro. 25 GW nuclear @ $4b/GW = $100b + 8GW pumped hydro for $15b = $115b. Conclusion: Option 2 (nuclear + pumped hydro) is the lower cost option. 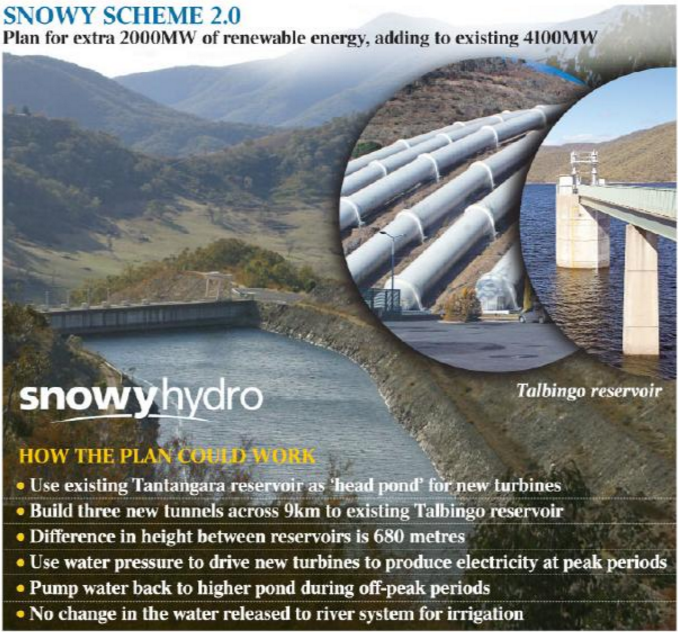 I had a quick look at your idea of a pumped storage scheme between the Tantangara and Blowering resevoirs in the Snowys. I have only spent a couple of hours looking at your numbers for the assessment of the technical and economic viability of such a scheme. It is my personal view as an individual and not that of the company I am working for. 2. Assuming 3 No.s tunnels of diameter D = 12.7 m gives a cross sectional area of Atot = 380 m2. 3. Assuming a maximum flow velocity of v = 3 m/s to keep friction losses within a reasonable range, the total discharge Q = v * Atot = 1,140 m3/s. 6. The discharge volume V = Q * T * 3,600 = 12.3 106 m3. 7. With a reservoir area of Ares = 2,118 ha and assuming vertical reservoir walls, the drawdown over the 3 hour operating period will be Δh = V/Ares = 0.6 m which is acceptable from an environmental and safety point of view, I think. 8. Assuming that the operator can sell peaking power at 4 times the rate as he has to buy the power for pumping during off-peak times, say $0.60 generating vs $0.15 pumping costs, the annual revenue from the scheme would be R = ($0.60 – $0.15) * 8.6 106 = $3.87 billion per year. 9. I am not a mechanical engineer but I believe that at a head of H = 827 m you are pushing the envelope of what turbines can take. I also think that you may need more than 3 units, say 6 or 9 to keep the size of the turbines and pumps and the width of the underground cavern to a reasonable size. 1. The tunnel is by far the most expensive single item so I have focused on that. I do not have a price for a 53 km long, 12. 7 m diameter tunnel excavated by TBM so have used a 8 km long, 3.5 m diameter tunnel and scaled it up to give an approximate figure for the bigger tunnel. Assuming that the tunnel will be mostly unlined and constructed in essentially sound rock, the costs for excavation, support and care of water during construction is $ 7,560,109,000, which is more than double your figure. 2. You have scaled up the 1967 costs of T3 to arrive at the other major cost items. 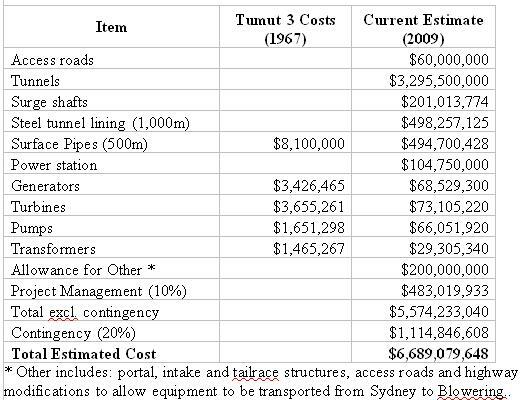 If my tunnel cost figure is correct, I fear that the other cost items may also be higher than what you have estimated. 3. If this is the case, the construction costs may be closer to $15 billion than $7 billion as you have estimated, which will bring the cost per installed kW back into the range of $2,000/kW which is about what pumped storage schemes cost these days. I do not mean to discourage you but the capital expenditure for a pumped storage scheme between Tantangara and Blowering seems prohibitive because of the scale of the investment, the high up-front costs and the long period for investors to recover their money. Unfortunately, politicians and banks take a much shorter view of life when it comes to political or financial gains and it seems to me that your idea, as much as I like hydro, seems to be condemned to the ‘not economical’ basket. — The proposed capacity of 9GW (9000 MW) is huge. Compare to Itaipu (12,600 MW), previously the world’s largest hydro plant and now Three Gorges (ultimately about 22,000 MW) or Revelstoke (2000 MW, soon to be 2500 MW when Unit 5 is completed). — The proposed number of turbines is 6, which translates to 1500 MW each. I believe the world’s largest turbine capacity to date is about 750MW. (e.g. the turbines at the Sayano-Shushenskaya dam in Siberia which recently experienced the world’s worst hydro plant disaster to date – check it out on Google if you are not familiar already). — The head is very high as you note. I believe Francis turbines have been built for heads as high as about 800m, but probably not for large capacity. — Your overall cost looks quite low at less than $800/kW; as you note, world experience is typically several times that today. — Your stated uncertainty of 25% is too optimistic. When we do a conceptual level estimate by a qualified estimator, we state that the uncertainty on the upper end is as high as 100%. The uncertainty goes down as more design is done, and we would not claim 25% uncertainty until we were into final design. — Steel lining is one of the more critical cost factors. For many high head projects, the cost of steel lining is the factor that determines whether the project is economic or not. You need to know in situ stresses etc to do a proper analysis. Snowy 1.0 took 25 years, so how long will Snowy 2.0 take? Pumped hydro energy storage systems are seldom economically viable nowadays (“Snowy fix for power crisis”, 16/3). They are most economic when their energy storage capacity is near-fully used almost every day, and power for pumping is supplied by reliable, cheap, off-peak power at night so that they can generate to meet peak demand at times of peak prices each day of the year. Reliable, constant full power for pumping can be provided whenever required by baseload power stations (coal, gas or nuclear), but not by intermittent, weather-dependent renewables such as wind and solar. The Snowy Hydro pumped storage proposal would be closer to being viable if baseload power stations that supply cheap power at night – like the coal-fired Hazelwood power station in Victoria – provide the power for pumping. Correct on all counts Peter. There’s a touch of irony mind about this latest bit of political posturing by Malcolm Turnbull, promoter of the current Snowy 2.0 thought bubble in so much that it is primarily the RET legislation, supported by both he and Shorten, that is driving the reliable, low cost, base load coal generators essential to such a scheme out of business. The most recent victim in this war on coal of course is Hazelwood, one of a number of coal power stations in Victoria and NSW that have quietly, unobtrusively for more that 40 years been providing cheap off-peak pumping power to the Snowy Scheme’s two small, existing pumping schemes at Jindabyne and Tumut 3. If real world economics was the yardstick Snowy 2.0 wouldn’t fly, but if Turnbull is prepared to commit billions more in “free” taxpayer subsidies then, as with the wind scam, the rent seekers will come out of the wood work and the sky’s the limit as they say? Questions – How much would it cost and how long to build a clean-coal and/or nuclear energy generator – one in SA and one in NSW or Victoria, large enough to produce constant base-load energy sufficient to secure reliability and cost effective pricing of energy to the end user? Would it be cheaper and possibly quicker than adding to the Snowy Scheme? Is it wise to mess about with water supplies that are necessary to ensure supply to so many along the River Murray’s course? What happens if we have a drought to energy supply, will water water (if its available) be taken from those relying on it? We have seen what happens when a drought occurs – Tasmanian is an example not to be ignored. Rushing in like water falling to create energy is not the way to solve the problem of energy supply. Maybe it time politics with respect to energy supplies was set aside until this situation has been resolved. By far the cheapest option would be to keep Hazelwood running until it is replaced by another baseload power station during the normal course of events. Jackie the much vaunted Snowy 2.0 Scheme as outlined neither adds nor subtracts from the total water available to Snowy. The new proposal would reuse the same water over and over, basically pumping it up the hill then generating energy when it runs back down. Peter Lang’s reply above is correct, pumped storage, if it is to be economically, viable needs cheap reliable pumping power, wind power is most definitely neither. So the man who mucked up the Murray-Darling scheme, imposed useless light globes on us, wanted to impose an ETS on us, left the ABC running amok, further mucked up the farcical NBN scheme is suddenly an engineer. Turnbull has risen so far past his level of incompetence that he is living proof positive that the Peter Principle does not work.